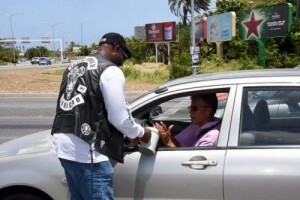 WILLEMSTAD - The Curaçao Motorbikers have collected 5000 guilders for the Handicap Rights Foundation. Last weekend, the tough guys collected at various supermarkets and along the road at traffic lights. This is the month where traditionally funds are collected for the foundation. Those who cooperated were also told that the tough guys have a good heart and have the best intentions for the community on the island.